French Polynesia is an Overseas Collectivity of France located in the South Pacific, made up of several groups of Polynesian islands, most famous of which is Tahiti. The islands where visited by ships from many of the European nations, however, it was during the early 1800's that France sent out many mssionaries to try to convert the local populace to Christianity. However, many missionaries where expelled, which led France to protect the missionaries with a gunboat. Finally, in the late 1830's, France formally took over the territories and turned it into a colony. Finally, in 1889, the territory of French Polynesia was formed with the further annexation of several islands in the area. The islands became famous post 1962 for having to play host for France's nuclear testing which has left several atolls totally uninhabitable. Each group within French Polynesia plays host to several groups. 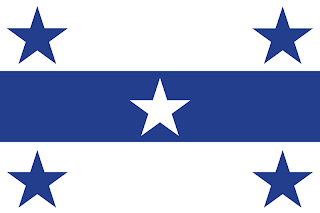 Each with its own flag. 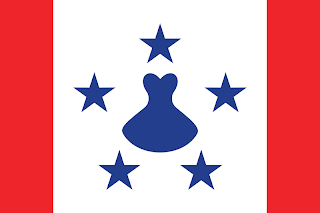 The flag of the Gambier Islands is a simple white/blue/white horizontal tricolore with 5 stars. 1 blue star in each corner, and a white star in the centre. 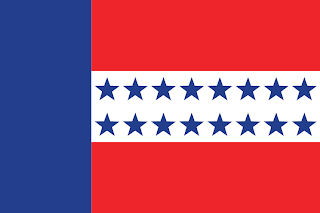 The Tuamotu Archipelago has a red/white/red horizontal tricolore with a blue vertical bar on the hoist side. 16 blue stars are arranged within the central white bar. The Marquesas share some similarities with the flag of the Philippines. A horizontal bicolour with a triangle place on the hoist of the flag. 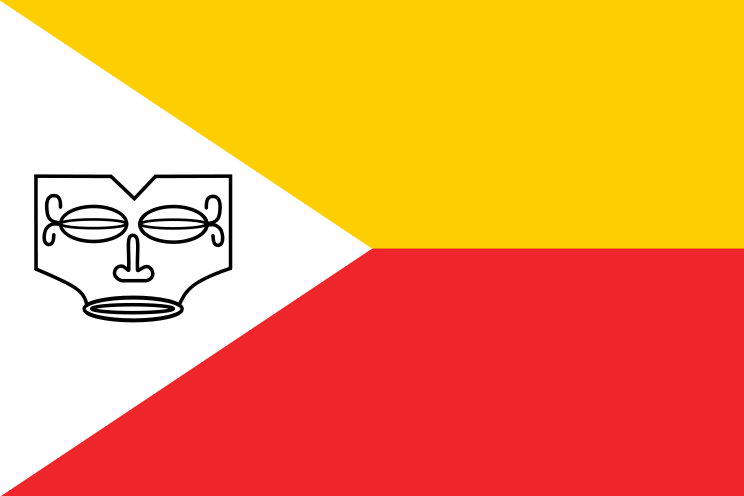 However, the top of the bicolour is yellow and red underneath. In the white triangle is a stylised image of a mask. The Austral Islands flag features a central white square bordered by 2 thin red vertical bars. In the centre of the white square is a representation of an island hat in blue, surrounded by 5 blue stars. 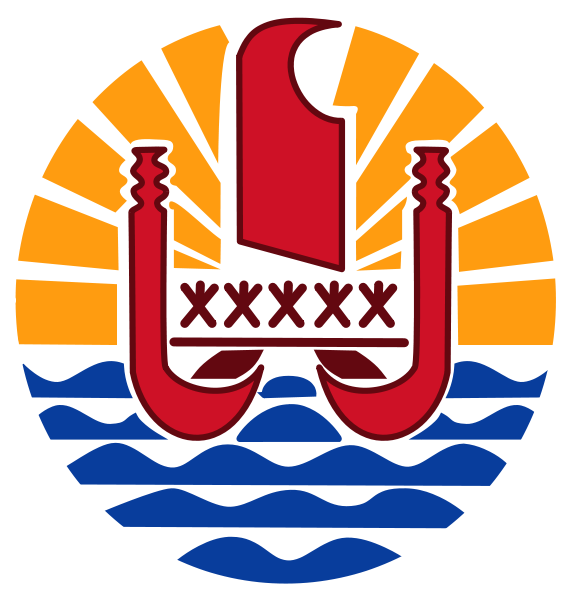 For the territory of French Polynesia, the coat of arms consists of a disc featuring a stylised sun and sea. Overlaid with an image of a Polynesian outrigger canoe in red. 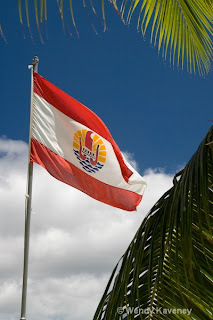 The flag itself uses the emblem of the island and places it in the centre of a central white horizontal stripe. 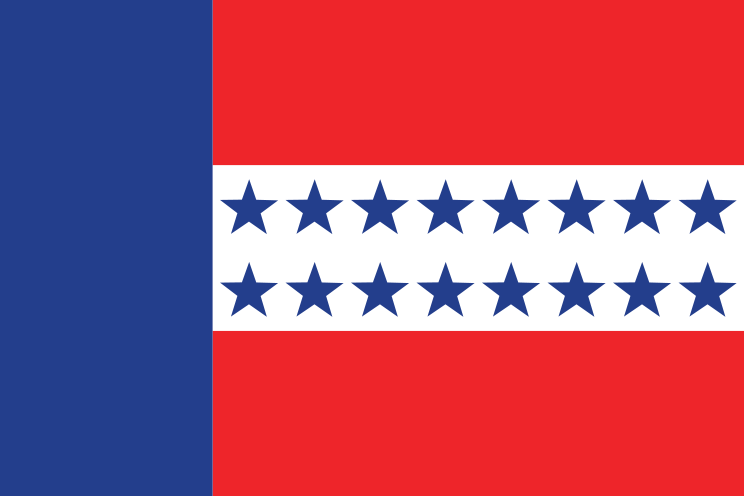 The white horizontal stripe is bordered by 2 red stripes.